If this card is Link Summoned: You can discard 1 card; if this card was co-linked when this effect was activated, you can draw 1 card, also, during your Main Phase this turn, you can Normal Summon 1 monster from your hand to your zone this card points to, in addition to your Normal Summon/Set. You can only use this effect of “Knightmare Goblin” once per turn. Neither player can target your co-linked monsters with card effects. Knightmare Goblin has got the hype behind it as the best of the Knightmare monsters, and many players would agree. Simple to Link Summon, 2 monsters with different names is doable for any player. 1300ATK is okay for a Link 2, and the arrows pointing on the sides means you are more likely to link this in one of your Main Monster Zones once you’ve started Link spamming the field. Having a co-link with the Knightmare cards is everything for their effects. A 1-for-1 for a draw and an extra Normal Summon to a zone Goblin points to sets up a Link 3 or 4. This helps facilitate effects that only happen when monsters are Normal Summoned. Protection for all co-linked monsters with Goblin’s effect ensures targeting effects go offline as long as the co-link exists. For one card from your hand to give you another Normal Summon, a draw, and protection, and to be able to get the extra Normal Summon and draw each turn you can activate it makes Goblin a fantastic option for decks that do a lot of Link Summoning. This card is great, but it all hinges on having that co-link. Knightmare Goblin kicks off the week with an ok play on words joke but terrible stats. It’s a Link 2 Wind Fiend-type Link Monster with 1300 Atk and Left and Right Arrows. You only need two differently named monsters to Link Summon Goblin, but all the benefits happen if it is co-linked to another Link Monster. If it is, all co-linked monsters are protected from targeting effects of your opponent, whether Goblin is co-linked itself or not. Usually it will be in the main monster zone next to perhaps another copy of itself or a different Knightmare monster. Its hard once per turn effect is to give you an Extra Normal Summon the turn Goblin is Link Summoned at the cost of a discard from the hand. As a bonus, if Goblin was co-linked when you discarded, you get to draw a card. So it’s a much lower card investment than Brilliant Fusion to give you draw power, an extra Normal Summon, and protection. Knightmare Goblin is the good news for the Monday Blues. I got to pick the cards this week and I decided to look at some of the Knightmare cards from Flames of Destruction since we have yet to dive into that set, starting off with one of the better Knightmares, Knightmare Goblin. Goblin is a Link-2 WIND Fiend requiring 2 monsters with different names, has 1300 ATK, and arrows pointing Left and Right. 1300 ATK is bleh for giving up two monsters. Left and Right arrows make it good for the main monster zone and works well with its effects. WIND is sadly not that great of an attribute, but Fiend is a good type. The summoning requirements are easy enough to fulfill. 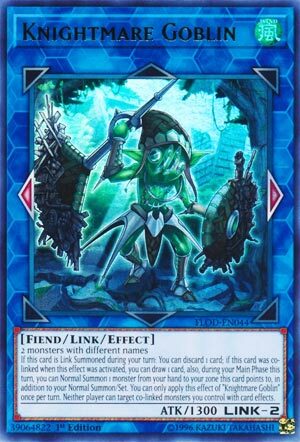 When this card is Link Summoned, you can discard 1 card to gain an additional Normal Summon to a zone Goblin points to and then if Goblin is co-linked, you can draw 1 card. The Knightmares are based on co-linking and the arrows are meant to help Extra Link as you will see soon enough. Gaining an additional Normal Summon at the cost of a discard isn’t bad if you have enough hand resources, and the draw will be nice if you get this co-linked. This is a hard once per turn effect of Goblin. While Goblin is co-linked, your opponent cannot target co-linked monsters with card effects. Targeting protection for multiple monsters is great, I’m glad it also includes himself. Goblin is a great card for Link Spam decks and worth investing an Extra Deck space for. Art: 4/5 Knightmares have some good artwork. These Knightmare cards were the next logical step in a week to review, in my opinion. Knightmare Goblin opens the week, being Link 2, with arrows pointing to either side, who is a Fiend (as you’d expect a Goblin to be) with 1300 attack. Wind attribute strikes me a little weird though. The Link Summon is fairly generic, you have to use two Monsters, but they have to be differently named. The first effect is a nice 1-for-1, where as by discarding a card from your Hand, you get to Draw a card from your Deck, so long as this card was co-linked at the time. To add ease to this effect, as well as cycling, you’re allowed during Main Phase 1 to Normal Summon a Monster from your Hand to a zone this card points to, which should all but ensure you get the discard/draw. Finally, neither player can target a card you have co-linked to this, which is GREAT, and only furthers the protection and advantage you can get from your Goblin. These effects are once per turn, which is absolutely necessary to prevent turbo draw options and maybe even fuel for OTK. This is a great card, and honestly, one that can be used in and out of the Deck.